The only thing better than one cat is, definitely, several cats. But getting more than one cat to get along and share space can be a little difficult – despite being adorable little furballs, they are still natural predators and hunters prone to be territorial and possessive, and even cats that get along perfectly with one another one minute might find themselves wrestling for dominance to sit on a window ledge to stare at squirrels the next. This can be a headache for cat parents, especially with all the collateral damage that might happen with energetic felines running around the house. Which is why a cat tree can be such a blessing to have in a home with multiple cats. The right tree gives your kitties a space in the house that is entirely their own, with multiple platforms so they can climb and stake separate perches while still fulfilling the need to be on an elevated surface to feel secure from potential opponents, avoiding territorial disputes since they don’t have to fight for a perch. The best trees come with attractive features like plushy cat beds or hammocks for your feline friends to nap in, sisal posts for scratching at, and of course a place your cats can mark up with their scent without being confused, troubled or threatened by other scents on pieces of furniture and items you use around the house – meaning all that shed cat hair and trimmed claw bits are limited to one part of the house rather than all over the place too. Take a look at our picks for the best cat tree to go for if you have more than one cat. 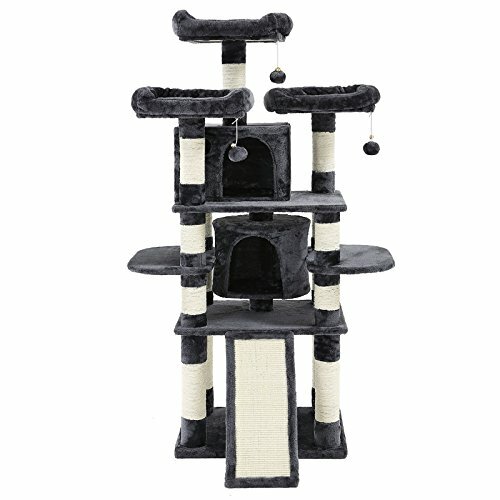 Almost a jungle gym of a cat tower, this faux fur and compressed wooden structure features two houses with multiple entries, exits and windows and three perches to keep a litter of cats occupied, several steps and ladders making climbing and access to the different heights an effortless and fun activity for your fur babies. We love that the height allows for your cats to seek out high perches without having to battle it out for dominance, the multiple platforms giving them the chance to settle on the height they find comfortable, be it in a cubby hole close to the ground for a quick nap or to seek out treats, or towering over their environment so they can keep an eye on what’s happening without feeling threatened or wary. The rugged, sturdy posts ensure the tree does not wobble even as more than one cat leaps on and off it, so your pets will feel secure while as they climb, the supports wrapped in sisal rope giving your cats plenty of space to scratch and trim their claws without having to resort to damaging your furniture and walls instead. The tree is available in three color options (beige, blue and leopard print), the angled edge of the base letting you situate it in the corner of a room, capitalizing on vertical space without eating too much horizontal space in your home. The tree also features dangly cat toys for your cats to jump, pounce and swat at, so they can keep themselves entertained. 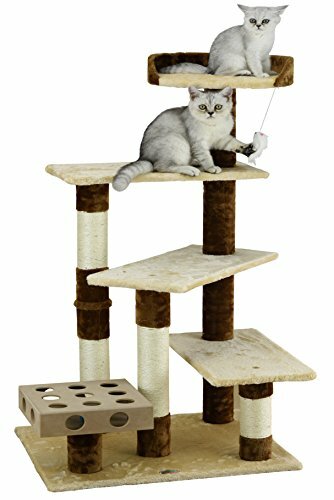 Armarkat Cat Tree – 57 in. 57 inches tall, with two perches and a cubby hole, and not to mention several steps and platforms for your cats to parkour through, this rugged structure is composed of compressed wood boards and faux fleece, making for a comfy but nonetheless rugged tree your cats can navigate without the fear or risk of becoming unstable. The unit is great if you have two or three cats, allowing each kitty their own perch with space left over for others to settle or play, a dangly cat toy stimulating their instinctive need to swat and pounce while sturdy sisal posts sate their scratching urges and keep other surfaces around the home safe. The tree can hold a maximum weight of 40 pounds, and is available in other structures and heights, with the maximum available height being 58 inches (an inch taller than our pick). This almost makes us think of a luxury den – for cats. 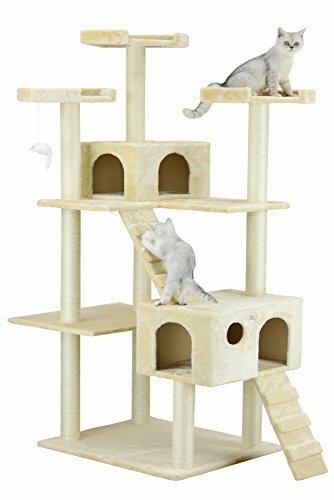 The dark, plushy platforms and perches give off a classy vibe, but we’re even more impressed with the design of this tree, making the most of vertical space with three perches and two elevated cat houses, without eating up too much space horizontally. Great for a multi-cat household, the unit features a ramp and several steps to help your cats get about, several dangly pompom toys for them to swipe and pounce at, all with sturdy sisal-wrapped posts and a sisal scratch pad on the ramp for your cats to scratch away at. The roomy cubby holes are big enough for more than one cat to snuggle down in together – though this depends on how big your cats are – the enclosed and plushy space allowing them to feel sheltered, safe and warm as they wind down. The perches also have soft, plushy rims for your cats to lounge back in as they survey their surroundings. 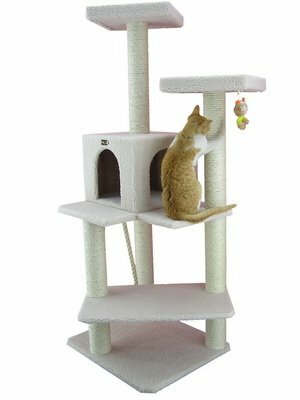 More basic but just as functional, this 45 inch high cat tree structured out of compressed wood and faux fur features several wide tiers functional both as perches and as steps to use when bounding up and down the tower, with a plush-rimmed perch at the very top. Removable dangly toys and a peek-a-box featuring holes over the top and along the sides so your cats can keep themselves entertained reaching through them trying to get at the ball inside make this a great play area to keep your cats occupied. Robust posts wrapped in sisal keep the tree stable as your cats jump about and hang off of it, as well as giving them a place to scratch away to their heart’s content.